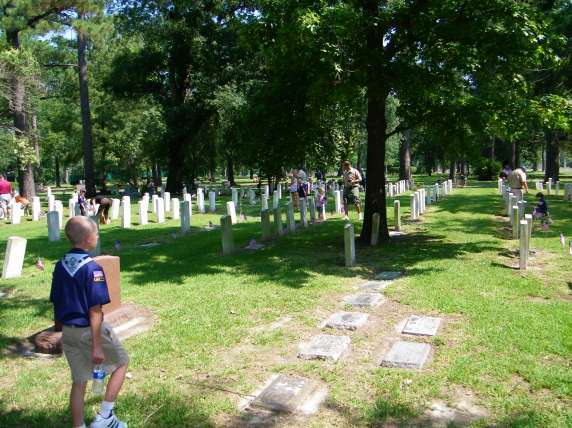 Woodlawn Funeral Home and Cemetery General Manager, Lynda G Seaman, was pleased to announce hosting Cub Scout Pack 552 , Terrace United Methodist Church to help us commemorate Memorial Day on our Cemetery grounds in Houston, Texas. About thirty scouts and as many parents and family joined together Saturday, May 29. The group listened to a brief presentation prepared by Woodlawn Funeral Home and Cemetery on the history of Memorial Day. They also received information about the significance of the Veteran markers they would be seeing and how to understand the significance of the designations on the markers. After this presentation, the scouts and their family members spent the next hours placing American flags provided by Woodlawn on each of the markers in our “Little Arlington” section of Woodlawn Garden of Memories. 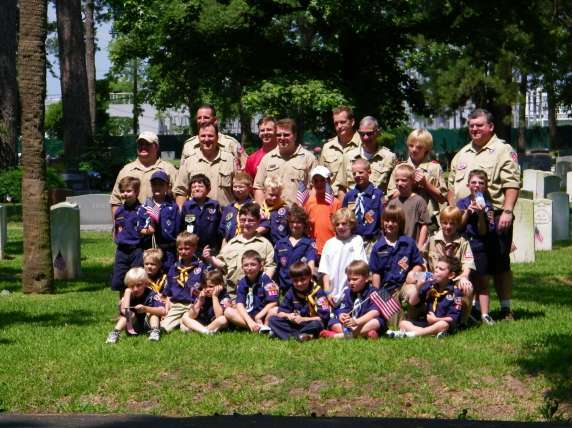 After this activity, Woodlawn Cemetery staffer Carl Haynie hosted the scouts and visitors with pizza and soft drinks at the Woodlawn Cemetery offices before continuing their Memorial Day activities. Woodlawn staff and the Scout leaders agreed that this was a valuable opportunity to offer the 7 to 11 year old members of the Scout Pack the value of acknowledging the contribution made by our Veterans, and the value of a chance to remember and acknowledge the grave site memorials to all veterans, as well as all of our family members. This small slice of time from holiday activities will be remembered by all of the participants as a time to honor and decorate the final resting places of all who contributed to our great country and the freedoms we enjoy.